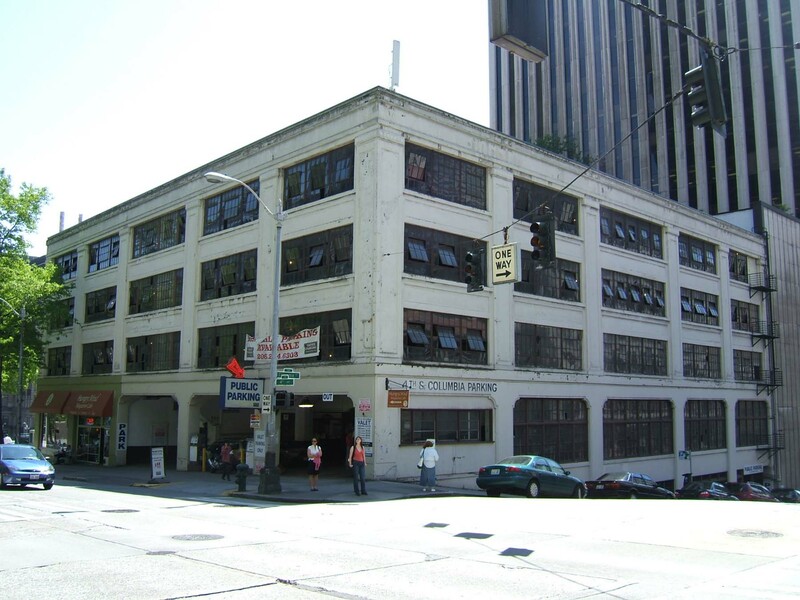 Located at the sloping SW corner of Fourth Avenue and Columbia Street, this four-story building was designed and constructed as a garage and automobile parking facility with three retail storefronts. It continues to be used for these purposes. It measures 120’ x 120’ and exhibits a two-part commercial block façade composition and utilitarian design character. The reinforced concrete structure with a concrete foundation and basement is finished cement plaster. It exhibits five structural bays at each of the two principal elevations. The base is dominated at Third Avenue by wide entry/exit openings with shouldered arches at the three northern bays. The southern two bays are retail storefronts that have been altered and modernized. Shoulder-arched openings with industrial steel sash infill dominate the north elevation at this same floor level. The easternmost bay on Columbia Street has a shoulder arched opening like those at Third Avenue; however it has been infilled. The shaft is dominated by structural piers with recessed cast panels and simple caps. Recessed spandrels and wide expanses of multi-pane industrial steel sash at each floor level define each bay on both principal elevations. The steel sash appears to be original. Each opening includes a group of three multi-pane window panels with an operable central pivoting window at each panel. The building is capped by a simple concrete cornice and slightly corbelled parapet with diamond patterns and small inset panels that correspond with the bay spacing/ structural piers. With the exception of the modern retail storefronts, the building exhibits few alterations. There do not appear to be any intact or architecturally significant interior building features, finishes or public spaces.